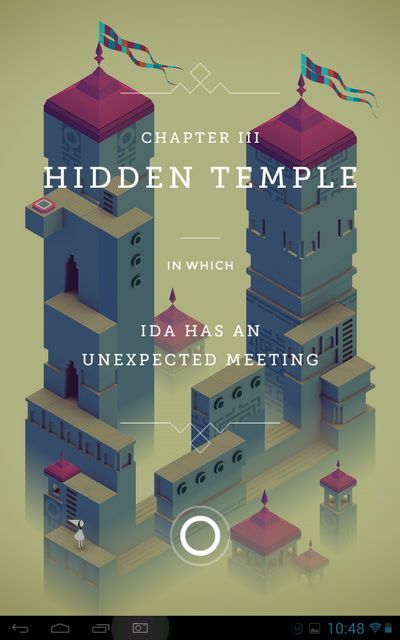 At long last the very successful monument valley game for apple ios has just been released for android at £2.49. The game by ustwo a London based app design studio is a puzzle game based on the drawing and work of MC Escher. The game when released from apple devices sold over 500 thousand copies within just a month, so should be a major success on android. The android version supports syncing of save vanes across your devices using googleplay. The aim of the game is to move parts of walkways in different directions to make a complete path to get your character to the finish. This may involve moving a platform to a position that defies perspective. It does sound simple but can be a little puzzling to do each section of a level. In total there are ten levels this may sound short but each level is broken down into sections, though you could probably complete the game within a few hours. But the graphics and addictiveness of the game will make you want to play over and over again. I have just downloaded the game and played the first two levels and it is very addictive. I have been waiting for this game to be released for android ever since the release on ios a few months ago. It really reminds me of the PSP and PlayStation game echochrome which I had on my PSP and did really enjoy playing that so really looking forward to fully playing monument valley and at just £2.49 is great value for a very addictive game, though I do hope more levels are added in the future. Here is the official description from Google play.